Precedents were shattered by candidates in races across the country. The first Muslim-American woman in Congress. The first two Native American congresswomen. The first openly gay male governor. The 2018 midterms will be remembered as an election of firsts that swept in a class of politicians who better represent the diversity of the country than any before it. 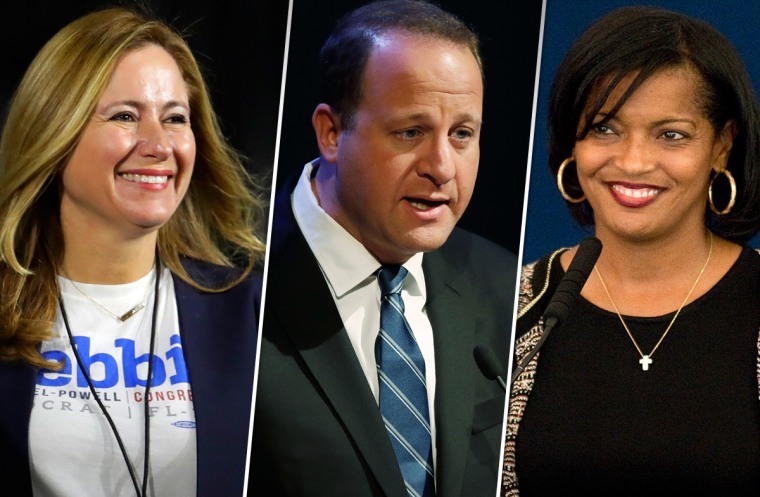 More than 200 of the candidates running in congressional and statewide races on Tuesday were black, Latino, Asian American, Native American, LGBTQ or intersectional. More than 80 of those candidates won their elections. Connecticut also elected its first black congresswoman. Jahana Hayes, a schoolteacher and first-time candidate, defeated Republican Manny Santos, garnering 55 percent of the vote. In her victory speech, Hayes paid homage to Shirley Chisholm of New York, who, 50 years ago this month, became the nation’s first black woman elected to Congress. Two races that could elect the first Korean American to Congress in two decades were too close to call as of Thursday morning. In New Jersey’s 3rd Congressional District, Republican Rep. Tom MacArthur led Democratic challenger Andy Kim by 1 percentage point. In California’s 39th Congressional District, Republican Young Kim led Democrat Gil Cisneros by fewer than 3 percentage points in a race that as of Thursday morning had not been called. Kim would be the first Korean-American woman elected to Congress. Veronica Escobar and Sylvia Garcia made history on Tuesday by becoming the first Latinas to be elected to represent Texas in the House. New York’s Alexandria Ocasio-Cortez, a first-time candidate of Puerto Rican heritage, will, at 29, become the House's youngest member ever. Michelle Luján Grisham made a first in New Mexico, where she was elected as the state’s first Latina Democratic governor. This year's so-called Rainbow Wave saw a record number of LGBTQ Americans who sought elected office. More than 600 out candidates in races that ranged from local office to senator ran this year. Of those, nearly 400 of them won their primary, according to the Victory Institute, which tracks LGBTQ political hopefuls. Of the 400, more than 20 ran for the House, the Senate or a governor’s seat, and of those 20, 10 won. Jared Polis of Colorado is set to become the first openly gay man elected governor in the U.S. Gov. Kate Brown of Oregon — an out bisexual and the first openly LGBTQ person elected governor in the country — won her re-election. In the House, seven of the 20 openly LGBTQ candidates won, 12 lost and one race is still too close to call. Democrat Sharice Davids made history by becoming the first openly LGBTQ Kansan elected to Congress. Davids and New Mexico’s Debra Haaland are the first two Native American women elected to Congress. Joe Murphy is a Data Editor at NBC News Digital. Nicole Acevedo , Sandra Lilley , Traci G. Lee, Brooke Sopelsa, Todd Johnson and Charles Lam contributed.